‘Crossing the Open Place’ is a subtle and quiet reflection of Sam Hacking's experience of anxiety within the landscape. Having lived with agoraphobia for most of her life, each scene is of a place where that anxiety has been heightened, both in a natural and unnatural sense. A dictionary definition of agoraphobia is: ‘Extreme or irrational fear of open places’. Initially explored through sculpture and performance on her BA at The Slade School of Art, her first paintings were actually born out of a performance where she gave tiny landscapes out to members of the public who were travelling abroad (in a performance called ‘The Traveller’), as if the paintings were self- portraits and thus acted as talisman in getting herself abroad. Shows that followed this continued to play around with performance and sculptural ideals, creating works on paper, postage stamps, playing cards, all involving some kind of live performance (a piece called ‘Tiger by the Tail’ involves 52 tiny landscapes on the backs of playing cards, repeatedly shuffled and laid out on a table by a croupier). 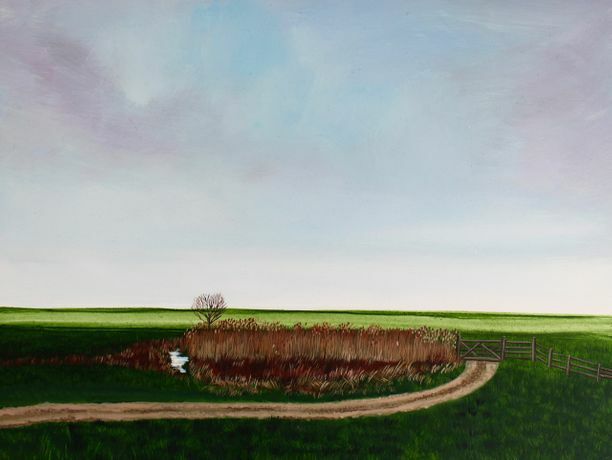 Growing up in Norfolk and Suffolk have definitely influenced some of the work, with a nod to flat horizons and marsh lands. But what’s interesting is how the paintings are constructed to dictate how you move into them. There are obstacles that the viewer either has to stop at or navigate around, be it lines of reeds or tree trunks, alongside sweeping roads or paths taking you off to a point in the painting with no destination. There is a sense of warding off the viewer, or deliberately directing them so they have no choice but to follow the various lines into the scenery. Similar hues of colour seem to repeat throughout the works, either being quite sombre tones, or colours that are borderline garish and sickly, evoking either a sense of anxiety or foreboding as if you’re about to stumble across a body. ‘Crossing the Open Place’ is a stripped back exhibition with the paintings standing on their own, and thus Sam Hacking’s most mature work to date. The paintings share a profound sense of purpose, being vehicles for the study of her agoraphobia and identity. 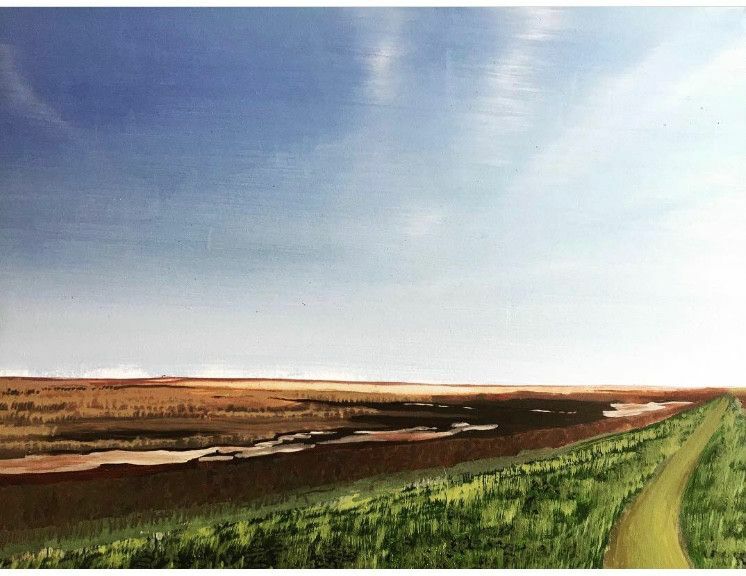 In spite of her paintings being executed with great detail, they’re far from photographic or realistic and remain as landscapes in a suspended state, giving the viewer a glimpse of a connection to the place and an attempt to have ownership of it in some way. It is a body of work showing that landscape painting doesn't simply have to depict a place or a state of affairs, but a state of mind. A moment where leaves don’t decay on the floor, grass doesn’t move upwards, there are no seasons or even a sense of tomorrow; the viewer is left briefly out of time with a sense of uneasiness.